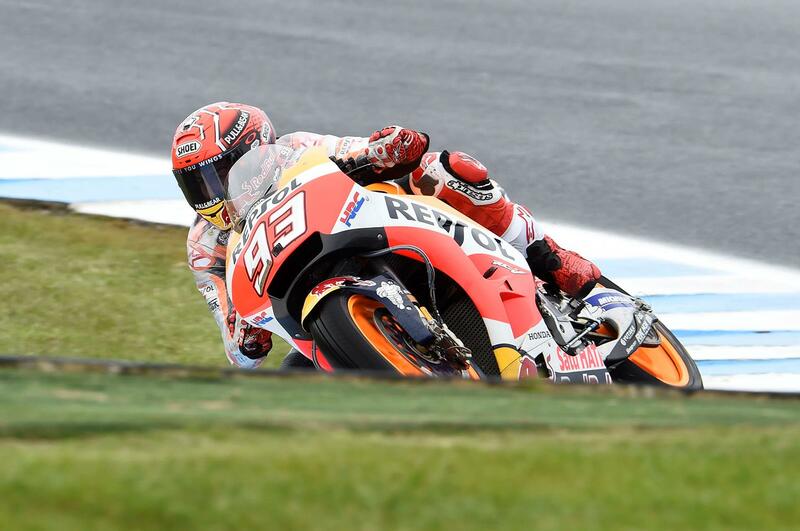 Marc Marquez has extended his lead in the 2017 MotoGP championship with only two races to go, after taking a stunning victory in a typical Phillip Island classic at the Australian Grand Prix. The Spaniard came out on top of an eight-way showdown that saw the Yamaha duo of Valentino Rossi and Maverick Viñales salvage a poor weekend with strong results. Jack Miller was an incredible early leader, making the most of strong pace all weekend to force his way through to lead a group of Marquez, Rossi, Viñales, Johann Zarco, Andrea Iannone, Alex Rins and Cal Crutchlow. But as race distance progressed, he dropped back, allowing the factory riders through to do battle for the lead. And as Johann Zarco made his presence known to his fellow Yamaha riders and Iannone in the closing stages of the race, Marquez was able to just ease away at the front, taking maximum points and leaving the four behind to fight for the final podium places. However, it was a disastrous day for Andrea Dovizioso, running wide at turn one and being left outside of the points. Eventually picking his way through to 11th, he got caught and passed in the closing stages by Scott Redding and Dani Pedrosa. He now goes into the final two rounds a huge 33 points adrift of Andrea Dovizioso.